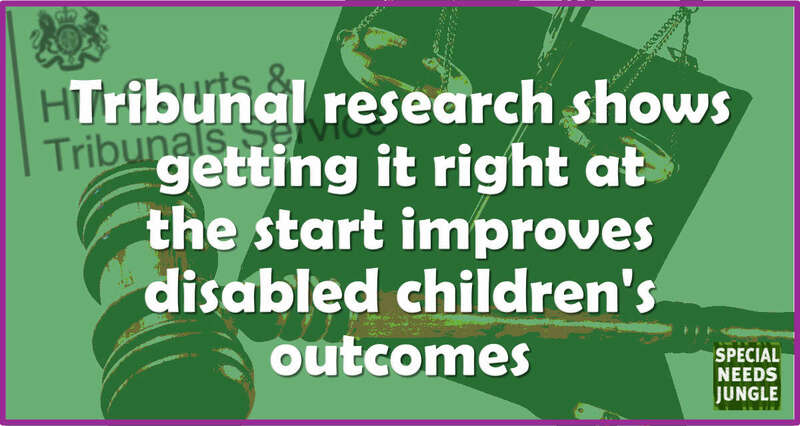 The most consistently effective way to resolve disagreements about SEND is to appeal to the Tribunal, according to the evidence contained in a complicated research report released by the DfE. 490 (94%) of the 523 appeals analysed in the research were either withdrawn or conceded or decided in favour of the appellant (the details are on p.130 of the report). The report, comparing different routes to resolving disagreement, was released late on Wednesday together with a joint response from the Department for Education and the Ministry of Justice. The research was carried out to meet a duty placed on the Secretary of State for Education and the Lord Chancellor in the Children and Families Act 2014. We...listened to families and stakeholders who told us they wanted a single route to raise concerns about education, health and social care in relation to EHC plans. We therefore ran, in parallel with the review, a pilot in the First-tier Tribunal SEND, whereby judges had the power to make non-binding recommendations about health and social care aspects of EHC plans, at the same time as making orders on the educational aspects. to understand the experiences and learning from a pilot of 17 LAs to extend the powers of the First-tier Tribunal SEND to make non-binding recommendations on disagreements about health and social care aspects of EHC plans. Tribunal Recommendations need to be binding: The pilot study at the First Tier Tribunal which allows recommendations to be made on Health and Social Care has not yet proven successful: these recommendations are not binding. There is no clear evidence that handing down recommendations to Children’s Services which they can ignore achieves anything. This is not altogether a surprise. However, CEDAR research highlights parent support issues on accessibility, how various roles supporting parents fit together and the impartiality of IASS. At SNJ, we think this is the right approach and builds a better long-term relationship between the Authority and the family. The research found that, among the sample of parents, legal costs incurred by those who paid for legal support ranged from £280 to £55,000. On average, the study found that £12,800 could be saved in each case by avoiding going to the Tribunal (eg. by mediation and good case management). What would be the cost to the child or young person of not having an independent view on the right provision to meet their needs – over the span of their education and over their lifetime? What would be the mental health cost of leaving a child or young person with inadequate support in an unsuitable environment? The report shows that mediation has its place and that the majority of decisions were reached without using one of the disagreement routes. But the First Tier Tribunal sets the benchmark for good practice in assessment and planning; and we know that the Upper Tribunal is consistently challenging the blanket policies of local authorities. If Local Authorities had to meet the costs of all Tribunals, they might review their policies and make more realistic decisions, instead of holding out until the day before the hearing and then conceding. The DfE has issued a very limited comment in the research but has indicated that we may see a new Code of Practice before the end of this parliament (2019). ...We are considering revising the SEND Code of Practice later this Parliament. As part of this revision, we will consider making the requirements in the Code for mediator accreditation stronger and clearer. There are important lessons to be learned from this research and we call on the DfE to set up a commission with parents, including SNJ representatives, to shape the future of decision-making in education, health and social care. DfE Training resources freely available. Please pass this link on to Education, SEND, Health and Social Care professionals and parents. Nasen Free training for all practitioners Their ‘Focus On SEND’ is a package of free online CPD for all mainstream education settings, covering children and young people from 0 to 25 years, across England. Barney Angliss runs his own consultancy in Special Educational Needs & Disability (ADLZ Insight Limited), having worked as a mainstream SENCo, Deputy Head of a Pupil Referral Unit and Local Authority SEND manager. Barney has Asperger's Syndrome and tweets as @aspiedelazouch. Re ‘ no national standards for LA SEN staff’, what happened to the BTEC National Award in SEN Casework, Levels 1 to 4? An insider provided information on our LA’s attitude to parents, every time a parent “lost” (which in reality means a vulnerable child suffered) against the LA a cheer went around the whole SEN department. You only have to look at the Baker Small fiasco to see what attitude LAs really have to parents and their children.